Today, I’m going to tell you about writing letters in French. Everything written in French tends to be more formal than in English; business letters, emails… and there are some quite archaic formulas that are still very much used nowadays. In this lesson, I will focus on how to start and end your French letter: you will find many precise expressions used right at the beginning and at the end of a letter in French. French people (or rather French business relations) will be more forgiving if you make mistakes in the core of the text, but for example writing “ma chérie” to a friend could send the wrong message. And choosing an unapropriate letter ending like “bisous” for a business partner would be a big faux-pas! So let’s study some French letter vocabulary. Before you even start writing your French letter, you need to select the correct title. If you don’t know who you are writing to, start your letters by “Messieurs”. If you are addressing your letter to “le Responsable des livraisons” but you still don’t know his/her name, start your letter with “Monsieur,” (even if you don’t know whether the person is a man or a woman). If you know the name of the person, start your letter by “Monsieur X, or Madame X,”. If it is someone you know, you met, or if you are answering to someone who wrote you first, then you can start with “Cher Monsieur X,” or “Chère Madame X,” if you feel like being a bit more friendly, not if you write to complain! Never write (Cher) Monsieur Pierre, nor (Cher) Monsieur Pierre X. Watch out with “chéri(e)” (do say the final “i”), we use it only with very close family and people you are in love with. Never with friends, although we did about 50 years ago. But is has changed. One step less formal, but still quite business like, good for emails for example (note these end on the comma): “Meilleures salutations,” – “Salutations distinguées,” both kind of “regards”. If it’s a not too formal situation, even for a professional relationship, you can write: “Cordialement,” this is kind of like “regards” to “warm regards” or “Bien à vous”, yours truly. 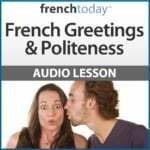 Check out French Today’s audiobook about French greetings and politeness. With acquaintances, or friends who are quite formal – or older, you write: “Amicalement,” or “Je vous adresse toute mon amitié,” kind of like “warmest regards”. Absolutely not formal: “Bizoux”, “bizoudou”… kind of like xoxo (which by the way, would be totally foreign to a French person who doesn’t know ‘hugs and kisses’ and could very much get confused by this symbol). Note that for all these expressions, the “vous” can also be used as a plural, and in this case may, or may not be as formal. Some rules of punctuation used when typing out a text are different in French than in English. I found that writing thank you notes is less frequent in France than in the US. We also have a much smaller market for greeting/special occasion cards and don’t send out these too often. In very posh families, it’s not uncommon to have a special pad made out with your name at the top, and you use that to answer invitations or send thank you notes. But it’s disappearing nowadays. You’ll write the address in the front of the letter, pretty much the same way you’d do anywhere in the US or Europe. For the name, you have plenty of options: so let’s take my name for example. My first name is Camille. My maiden name is Chevalier. My married name is Chevalier-Karfis (hyphenated names are not common for French people: most wives would just take their husband’s last name). My husband’s first name is Olivier. His last name is Karfis. Madame Olivier Karfis – very very old-fashioned and a tad snob. Using my husband’s first name and last name to define me… That’s the one my Mom would use. Then you’d go from the smaller to the bigger entity: start with the name (if it’s the business letter, then maybe the title, department, certainly the name of the company), Apartment number, po box, street number and address, zip code, town (sometimes followed by Cedex + a number in French). In France, the return address is written in the back of the letter, at the very top, across the width of the letter. However that can be confusing for your home country. This “from” in French would be “de:”, or “de la part de:”, or “expéditeur:”. Voilà, I hope this article will help you next time you write a letter in French. I post new articles every week, so make sure you subscribe to the French Today newsletter – or follow me on Facebook, Twitter and Pinterest. Check my audio lesson for more French expressions of politeness. You may also find this link about writing condolences letters in French. Good luck with your French studies and I’m looking forward to talking to you on Facebook/FrenchToday.